Cells always seem to find the best way of doing things. This is particularly true of essential functions, like the synthesis of proteins. Ribosomes need to be very accurate in their jobs, since they build most of the machinery of the cell. When adding amino acids to a new protein chain, they typically make only a single error for every thousand or ten thousand amino acids added. The rate for frameshift errors, which are far more dangerous because they corrupt an entire chain, is even lower. Cells achieve these amazing error rates by first proofreading the amino acids that are added to tRNA, then by tuning the interaction of tRNA and mRNA. The base immediately adjacent to the tRNA anticodon, adenine 37, is usually modified to tailor its function to its unique position. For instance, in Escherichia coli 10 of the 26 tRNA molecules have two bulky, hydrophobic groups added to A37, as shown here in a tRNA-mRNA structure from a translating ribosome (PDB entry 3i8g). These hydrophobic groups serve several functions. First, they prevent the adenine from forming improper base pairs with other parts of the tRNA, ensuring that the adenine and the neighboring anticodon bases are always in the perfect conformation for interacting with mRNA. The groups also stack on top of the anticodon, stabilizing the little double helix that it forms with the mRNA. Cells go to a lot of trouble to tune their tRNA, using a diverse collection of enzymes that modify the tRNA nucleotides after it is transcribed. The enzyme MiaA, recently solved by researchers at the Karolinska Institutet (PDB entry 3foz) 3foz and by an international collaboration including researchers from NESG (PDB entries 2zm5, 2zxu, 3exa and 3d3q), modifies the A37 position. 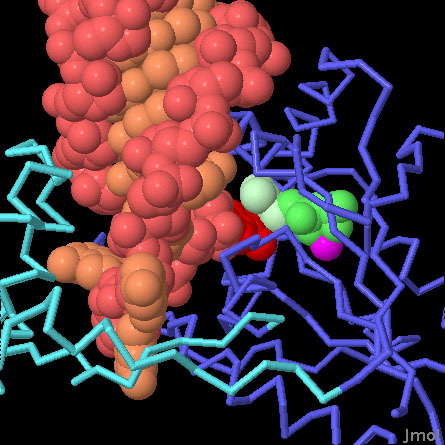 It is a small enzyme with a clamp-like shape similar to many kinases. It includes one domain that carries the catalytic machinery, and a second domain that opens and shuts around the tRNA. In the closed form, the swinging domain forms a tunnel that encloses both the tRNA and the small cofactor dimethylallyl pyrophosphate, which donates the hydrophobic group to the reaction. MiaA is not gentle in its treatment of tRNA. It grabs the tRNA and pinches the anticodon loop between its two domains, This distorts the tRNA loop, and pops A37 (along with several other bases) out of their normal position. In this way, A37 is gripped within the active site tunnel, perfectly positioned for the modification reaction. Four structures of MiaA show the enzyme in various stages of action. 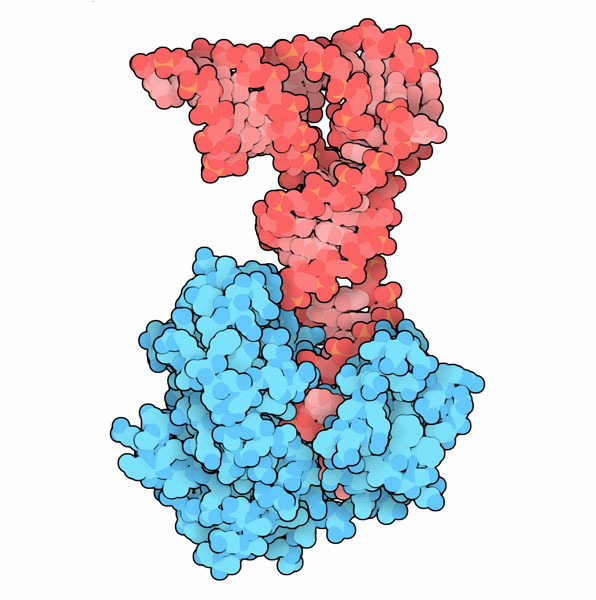 In these images, the enzyme is shown in blue with the swinging domain in brighter turquoise, the tRNA is shown in pink with the adenine 37 in bright red, the cofactor is in green, and a magnesium ion is in magenta. Use the buttons below to flip between these different structures. The structures of MiaA from Bacillus halodurans and Staphylococcus epidermidis show the enzyme before the reaction. Notice how flexible the swinging domain is in these structures. The structures of MiaA from Escherichia coli show the enzyme clamped around tRNA, and then with the cofactor bound, ready to perform the reaction. Chimnaronk, S., Forouhar, F., Sakai, J., Yao, M., Tron, C. M., Atta, M., Fontecave, M., Hunt, J. F. and Tanaka, I. 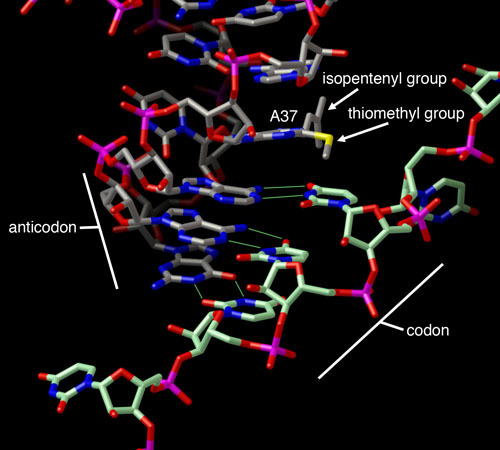 (2009) Snapshots of dynamics in synthesizing N6-isopentenyladenosine at the tRNA anticodon. Biochemistry 48, 5057-5065. Seif, E. and Hallberg, B. M. (2009) RNA-protein mutually induced fit: structure of Escherichia coli isopentenyl-tRNA transferase in complex with tRNA(Phe). J. Biol. Chem. 284, 6600-6604. Jenner, L. B., Demeshkina, N., Yusupova, G. and Yusupov, M. (2010) Structural aspects of messenger RNA reading frame maintenance by the ribosome. Nature Structural and Molecular Biology 17, 555-561.